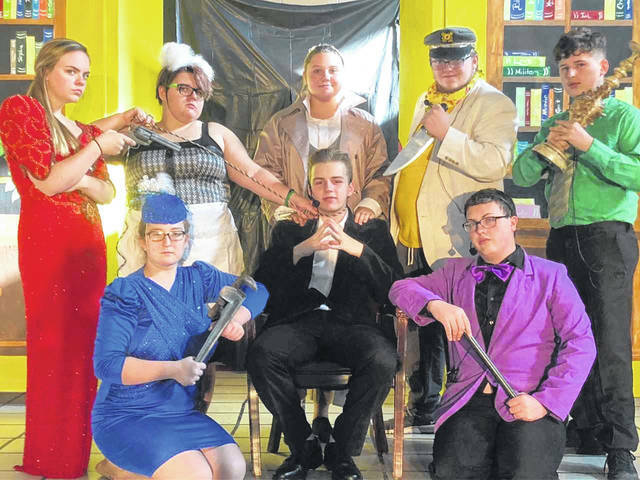 Members of the Wahama High School Chorus will be starring in an interactive murder mystery dinner-theater this weekend, when they present “Clue The Musical.” Saturday’s dinner begins at 6 p.m., with the show at 7 p.m. On Sunday, dinner will begin at 1 p.m., with the show at 2 p.m. The shows will have different endings, allowing people to attend both performances. NEW HAVEN — Who killed Mr. Boddy – Miss Scarlett with the candlestick, Colonel Mustard with the rope, Professor Plum with the lead pipe? The only way to find out will be to attend the “Clue The Musical” production, sponsored this weekend by the Wahama High School Chorus. The murder mystery dinner-theater will be based on the popular board game. With both Saturday evening and Sunday afternoon performances, the show will include audience participation. Those attending will play along with the cast, just like in the classic game. The shows will have different endings so people can enjoy both performances if they wish, according to Rachel Reynolds, chorus director. The spaghetti dinner will begin on Saturday at 6 p.m., with the show starting at 7 p.m. On Sunday, dinner is at 1 p.m., with the show at 2 p.m. The event will be held in the school cafeteria. Tickets are now on sale at the school. Prices are $10 for adults, and $8 for children or senior citizens. Infants are free. Dinner will be served buffet style, with spaghetti, dessert and drink of tea or lemonade. An additional drink stand will be available to purchase soda. Money from the dinner-theater will go toward the chorus trip to Washington, D.C.
For more information, contact the school at 304-773-5536.
https://www.mydailyregister.com/wp-content/uploads/sites/24/2018/10/web1_11.1-Dinner.jpgMembers of the Wahama High School Chorus will be starring in an interactive murder mystery dinner-theater this weekend, when they present “Clue The Musical.” Saturday’s dinner begins at 6 p.m., with the show at 7 p.m. On Sunday, dinner will begin at 1 p.m., with the show at 2 p.m. The shows will have different endings, allowing people to attend both performances.